SEO isn’t a plugin or a green dot. SEO is a process. So many times WordPress users get caught up with installing plugins and chasing a green dot of approval. Don’t get me wrong. I think the Yoast team and their SEO plugins are awesome. It’s the way WordPress users implement the plugins that I find frustrating. The problem does not lie with Yoast. It lies with users and their interpretation of the SEO process. More times then not, a WordPress user installs a SEO plugin and forgets about it or focuses heavily on the green dot of approval and nothing else. That is the wrong approach and is completely insufficient when trying to garnish sustainable, SEO based search traffic. WordPress plugins are tools within in an overall SEO process. Your goal is not to chase a green dot inside the Yoast SEO plugin. Your goal is to implement a solid SEO process and use the plugin as a tool within the execution of your marketing strategy. Really good SEO isn’t just about data. Good SEO is about website visitors and perfecting the user experience. I’ve had the same SEO process for about fifteen years. It will slightly shift due to Google and Bing’s algorithm changes, but the ultimate goal of providing a path to solving a user’s problem has stayed consistent. Now, more then every before, it is important to placed the focus of SEO on the user experience. It’s the heart of high quality SEO and it becomes more important with each new change Google rolls out. 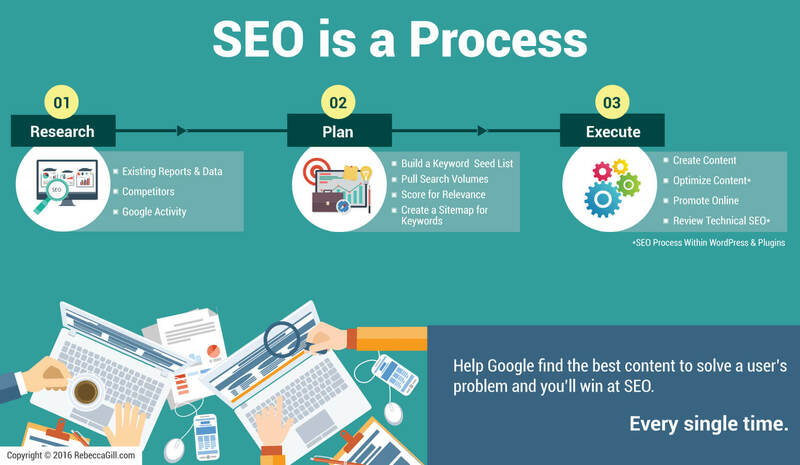 How Can You Define an SEO Process? You can start by reviewing the process I’ve used for years. It breaks into three segments and just over ten steps. Review existing reports and data from your website or blog. Review your competitors’ websites and third party reports. Validate data by reviewing actual Google activity and search results. Build a seed list of keywords focused on solving problems for your target demographic. Pull and review search volumes for your seed list of keywords. Score your keyword list for relevance based on how closely it matches your target demographic and offering. Match up focused keywords to your existing content and future content. Create killer, long form content that provides solutions to user problems. Optimize this content within WordPress by using trusted SEO plugins. Promote this content online and do old school PR to increase overall branding. Review your website and server for technical SEO and make improvements where needed. Review your progress, reverse engineer what is working, and repeat. Notice my process had no gimmicks or shortcuts or anything else that was a quick fix. That’s because SEO doesn’t work that way. Anyone who says it does is lying to you and setting you up for failure. SEO is work, but the rewards are like nothing else I’ve seen in my years of marketing and sales. It produces results and those results are long-term. Before my WordCamp presentations I performed a social experiment. I asked people on LinkedIn, Twitter, and Facebook to tell me the first word they thought of when they heard the acronym SEO. Tangled, fear, scam, shady, confusing, and frustrating were just a few of the negative words that what was given to me. That isn’t my SEO. When I think of SEO I think of: possibilities, success, revenue, leads, sales, growth, opportunities, options, power, liberation, freedom, powerful, prospects, customers, helpful, empowerment, and engagement. Why are my words so different then others? Because I have educated myself about what SEO is, what Google wants and needs to be successful, and how I can use SEO to help solve someone’s problems. I do not fear Google or SEO. I do not try to scam Google or my SEO clients. I try to help website visitors and clients by solving their problems. And lately, I’ve been solving a lot of problems by educating people on search engine optimization. Why? Because through education you are empowered. Through education you control your own destiny. When I help empower someone, I am energized and refreshed. That refuels me and propels me forward. It’s why I travel to conferences and talk about SEO, then spend days after answering emails from people who heard me speak. I do it for them, but I’ll admit, I do it for me too. Empowerment is infectious. Did I Leave Your With More Questions About SEO? Excellent! SEO is always changing and you should always have questions. The more questions you ask about your visitor, the more opportunities you have to win at SEO. I’d love to educate you, empower you, and inspire you to learn SEO and control your own online destiny. Anyone can be successful at SEO. You just need to understand the why, apply it to the how, and focus on solving problems. SEO Bootcamp – This is an two day training workshop coming this winter. It’s in person and seats are very limited. The early bird discount ends on October 31st. If you are interested in this event, you need to grab your ticket before we sell out. Online SEO Course – This is an eight hour online SEO course that you take at your own pace and as time allows. As with SEO Bootcamp, this goes through my process from start to finish. YouTube – My YouTube channel contains videos and webinars filled with SEO education. They are free and cover everything from the basics through keyword research and on-page optimization. They won’t go as in depth as the bootcamp or course, but they will be a good starter for you. Clarity.fm Coaching – If you have some SEO questions you’d like to ask, you can schedule a call with me via Clarity.fm. This is an excellent option if you have a basis for SEO and just have a few things that need clarification. SEO Consulting – If you don’t have time to learn SEO, but want someone you can trust, I do take on select clients for SEO consulting engagements. I can work directly with website owners or with marketing and IT departments at mid-market or enterprise companies, as well as outside vendors. Regardless of the path you choose, make sure you select something and you take that leap forward. 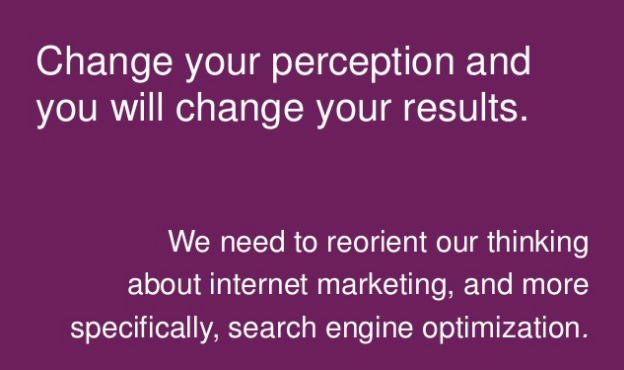 SEO opens the world up to new opportunities, but you have to take the first steps towards changing your perception of SEO and improving your traffic.